NYYRC ANNUAL TRIP TO Washington, D.C.
NYYRC Members embarked on the Nation’s Capitol April 26th – 27th, meeting and greeting with top Republicans on the Hill. Congressman Fossella and for the fantastic tour of the Capitol! Thanks to ALL YRs who participated. Can’t wait til’ NEXT YEAR! Grady gives examples of companies, such Cisco, E*Trade and Intel, that were relatively small IPOs yet now bring in billions in revenue and employ hundreds of thousands of people and goes on to say that in today’s regulatory environment, a company with a market cap of $50 to $100 million is more likely to be acquired than go public, thus depriving the economy of it’s full potential. He addresses the onerous and costly Section 404 – which can cost small cap companies $2 – $3 million/year (which at time of passage was expected to cost $93,000 per company), and notes that Chris Cox is working to address this issue. Though the barriers to entry for small-cap IPOs are not quite as dire as Grady makes it seem, he makes some really important points on how Sarbox and the regulatory climate are stifling innovative emerging growth companies in the US and could potentially have serious implications if nothing is done to relax the regulatory environment. It seems to me that momentum to relax Section 404 is increasing. Hopefully, this will happen sooner rather than later so that our companies can grow and remain competitive on the global market. Another development that could benefit US companies – the SEC is considering letting US public companies use international accounting standards, which would make it easier and more cost efficient for companies doing business internationally. Governor Spitzer is a big fan of Sanjaya, huh? Wonder if he voted for him? Imagine the People Magazine folks faces? The Democrats have certainly proven this with their latest plan to vote on a withdrawal later this year and declaring that the war is lost. I suppose they figure they have a no lose situation – if they did succeed in getting an early pullout and emboldened terrorists who just saw victory over a superpower come onto our soil to attack us, they’ll just argue that the terrorists only hate us because of Bush and the Republican party, so if the American public elects them instead of Republicans the problem will eventually go away. Check out more on the speech at Politico. Mayor Bloomberg announced his vision for a greener city yesterday, Earth Day. I, personally, really like some of his proposals, particularly the congestion tax. With 1 million new residents expected by 2030, it is time to start thinking of ways to improve the air quality of the city. Whether or not you are a believer in global warming, anyone who has blown their nose after an afternoon walking around the city (for those who haven’t, the tissue ends up black), can appreciate the idea of better air quality. The idea of congestion pricing is likely to be controversial and unpopular, but I believe it is worth the inconvenience if the end result is a cleaner, more livable city. I also love the plan for more bike paths! Hey Obama, isn’t it apparent, that a father is a parent? Now, I don’t mean to nitpick but imagine the reactions of John Stewart & Bill Maher if Bush said this. In typical fashion, they would probably show the audience a clip of that and stare into the crowd with big eyes as if to say “Can you believe he said something so stupid?”, then the crowd would laugh like they believed that since Bush said something, somehow that made John Stewart & Bill Maher funny. New York, NY –The New York Young Republican Club, Inc. (NYYRC) elected its 2007 executive board at the April general meeting last night at the Union League Club. The oldest continually running Young Republican Club in the Country elected Lynn Krogh as President, Kendal Elliott as Vice President, Michael Salomon as Secretary, Sharlene Santercole as Chairman of the Board of Advisors and re-elected Nicholas Vertucci as Treasurer. The new officers will assume their duties immediately. 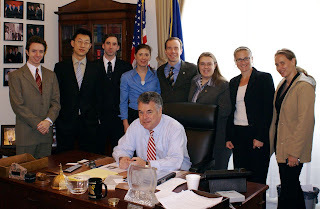 Krogh became involved with the Rensselaer County Young Republicans at the age of 19 in and quickly rose to the positions of Secretary and then Vice Chair. In 2001, she was appointed to the position of Capital Region Vice-Chair for the New York State Young Republicans, helping to grow county chapters in New York’s Capital Region. Krogh worked on the 2002 re-election campaign of Governor George E. Pataki and following the election, she joined the Governor’s New York City Press Staff. During that time, Lynn became a member of the NYYRC and since joining, she has served as Membership Chair, Secretary, and most recently, Vice President. She is also the Executive Director for the New York State Young Republicans and the Communications Director for the Young Republican National Federation. Kendal Elliott, the new NYYRC Vice President, previously served as Campaign Chair, acting as a liaison between the NYYRC and Republican campaigns for public office within New York City and the surrounding areas. Elliott has managed political campaigns on both the national and local levels and consults local candidates. Nicholas Vertucci was re-elected to the office of Treasurer, a position he has held since April 2005. Prior to his election, he served as Chairman of the Finance Committee where he represented the Club in discussing the overhaul of Social Security on CNN and on issues involving Wal-Mart’s attempts to come to Queens and school vouchers in the New York Sun. Nick is an avid blogger on the NYYRC’s Blog, The NYYR Record. Prior to being elected Chairman to the Board of Advisors, Sharlene Santercole served as the New York Young Republican Club, Inc. Membership Co-Chair for retaining members. Santercole joined the NYYRC in October 2003 and has volunteered for the NYC Host Committee and was assigned a COA Volunteer in Site Operations during the Republican National Convention. She also worked on NYYRC member Anton Srdanovic’s 2004 congressional campaign as a Volunteer Coordinator. Santercole is the National Committeewoman for the New York State Young Republicans and also serves on the Campaign Oversight Committee for the Young Republican National Federation. John Edwards has great hair. Of course, you would have great hair, too, if you paid $400 for a trim in Beverly Hills, as Demo presidential candidate Edwards has in recent weeks. Unfortunately, Edwards’ personal spending on haircuts is just the latest misstep by the man who is trying to appeal to America’s populist vote. Two weeks ago, his wife Elizabeth derided their neighbor for his “slummy” property. Now, don’t get us wrong—we live in a capitalist society that allows us to spend the fruits of our labor as we see fit, and if a man wants to blow $400 on a haircut, well, best wishes to him. Likewise if he can afford a 28,000-square-foot mansion. Edwards, though, will have a tough time convincing voters that he has even a clue about the less affluent of those “two Americas” he keeps talking about, but at least he’ll look good trying. NYYRC WASHINGTON, DC Trip UPDATE! Annually, the members of the NYYRC head to Washington DC and we’d love for you to join us for meetings and social events that we have planned thus far. Annually, the members of the NYYRC head to Washington DC and we’d love for you to join us for meetings and social events that we have planned thus far. Thursday April 26 & Friday April 27th are the key days we have planned.